SHARES in Orion Minerals have been suspended on the Johannesburg Stock Exchange on management request ahead of a capital raising-related announcement, due before trade in the stock resumes on April 15. 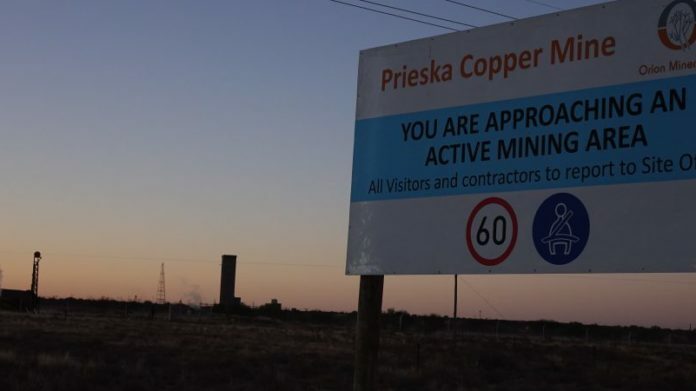 The company said on January 31 that financing its Prieska Copper Project was high on its agenda this year. “We will be considering various funding sources and will work to have project financing in place to move forward with a project development decision in quarter three in 2019,” said Denis Waddell, chairman of Orion Minerals, at that time. On January 25, Orion Minerals announced it had agreed with lender, Tembo Capital, that the UK fund provide a $3.6m loan facility. The facility is convertible into Orion shares at 2.6 cents/share, the same value as contained in an earlier convertible note between the two. Once Orion receives regulatory approvals and funding it would take about two to 2.5 years to develop the mine to first production. A mine of this size could cost about A$250m, the company said last year. The resource is situated on the site of an old mine previously operated by Anglovaal Mining in the Eighties. At the time it employed about 4,000 people.